Well if you have been watching what you eat lately (as I have been), you are probably getting sick of not eating pounds and pounds of carbs. I know I am missing Jimmy John’s sandwiches, toast, eggs benedict, and just basically anything that has bread. I think the most important part of any diet is cheating, and cheat days specifically. 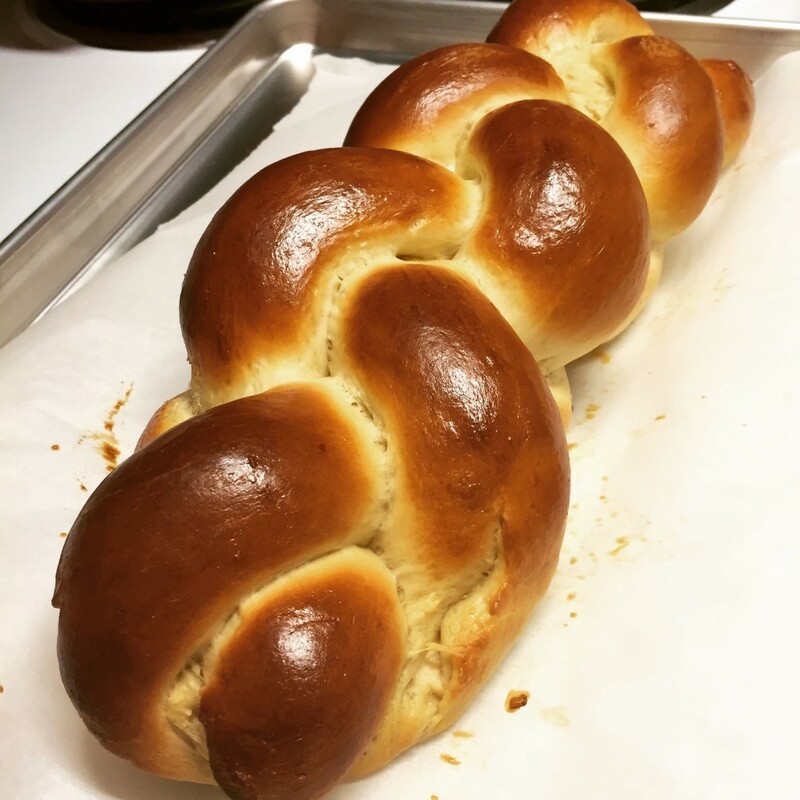 I was reading through blogs and stumbled upon this fabulous challah bread with a beautiful 6 strand braid and I just had to try it. This bread is as delicious as it looks. So when your cheat day Saturday rolls around, have fun with it and make this bread. Make french toast with it, sandwiches for lunch, and eat it with indulgent european butter for dinner. I started off with the 4 strand braid for my beginner loaf and could not be more pleased. This recipe comes from King Arthur Flour which is a very reliable bread recipe source. There are a number of comments with concerns regarding the water to flour ratio. I did not have any problems with it, mine turned out great with 1/2 cup water to 4 cups flour. There are 6 tbsp of oil which I think makes up for less water. This allows you to create a dough that is not overly sticky and can be rolled and braided. 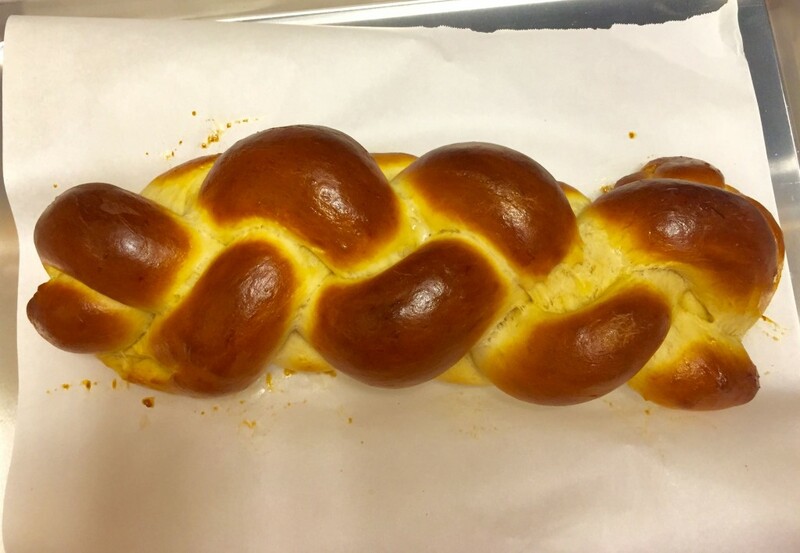 Challah is kind of a richer, eggy bread, traditionally served during the sabath. It is an enriched bread similar to brioche except that it contains no dairy. Brioche and challah are not the same thing, contrary to what some commenters at the King Arthur website seem to think. They both have one seriously important thing in common though… they make excellent french toast! I am working on mastering how to braid these breads. And I’ll say, it is really not that hard. Especially with the excellent pictures and directions from King Arthur Flour. In the bowl of a stand mixer, fitted with the dough hook, combine the yeast, water and honey. Allow it to foam so that you know its working. Mix in the vegetable oil, eggs, and salt. Turn the mixer on low and add in the flour, cup by cup, making sure the dough does not get too dry. Knead with the stand mixer for 7 minutes or until the dough springs back when pushed in with your thumb. Allow the dough to rise for 2 hours until doubled. (I placed mine in the fridge at this point and baked it later that night, just in case you run out of time.) Punch the dough down and transfer to a lightly floured work surface. Divide the dough into 4 pieces and shape each into a 6 inch log. Cover with a tea towel and allow to rest for 10 minutes. Roll each of these logs into a 15 inch rope. Cover and let rest for 10 more minutes. Roll the ropes some more until they are 20 inches long, they will shrink back a little bit to 18 inches. Lay them parallel to each other and pinch the ends on the left together. This is where you need to look at the pictures provided by King Arthur if you are having trouble. Take the rope nearest you and move it away from you over the two adjoining ropes. Then move the rope back under the rope next to it. Repeat this, but start with the rope farthest form you. Bring it towards you, across the two adjoining ropes. Then move it back under the rope nearest it, away from you. 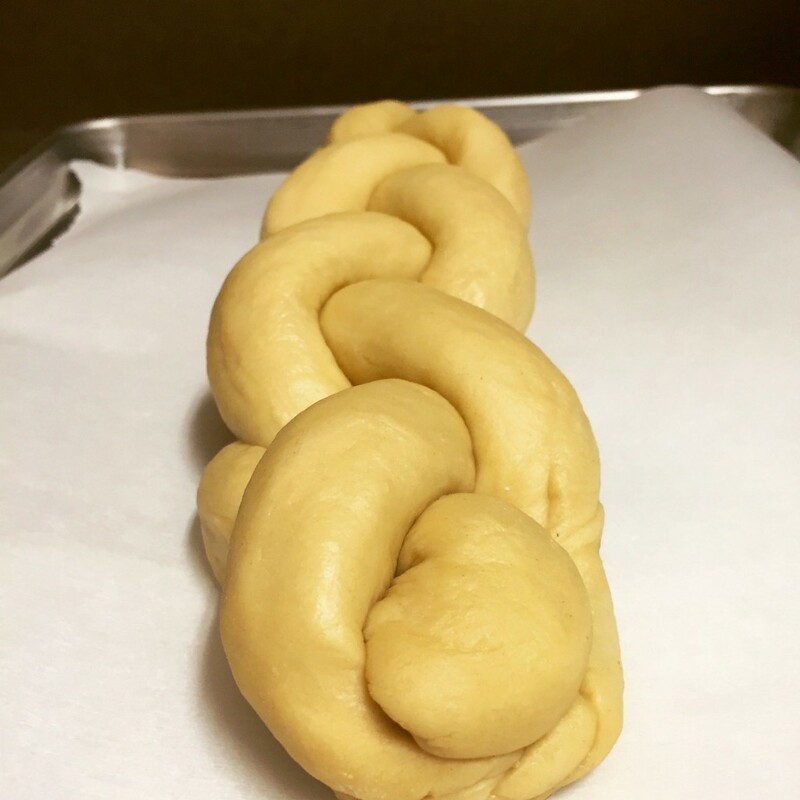 Continue, alternating sides, until the whole loaf is braided. Pinch the ends together and tuck underneath. Gently pick up the loaf and place it on a parchment-lined baking sheet. Cover with greased plastic wrap or a tea towel and allow it to rise until it is quite puffy, ~ 90 minutes. Preheat the oven to 375 about 15 minutes before the bread is done rising. Whisk together the egg and water, brush this carefully over the risen loaf of bread. Place the baking sheet on top of another baking sheet (to keep the bottom from browning too much). Bake for 20 minute. Rotate the pan, cover with aluminum foil, and bake for another 15 – 25 minutes until golden brown. There is a lot of variation here, so keep a close eye on the bread.